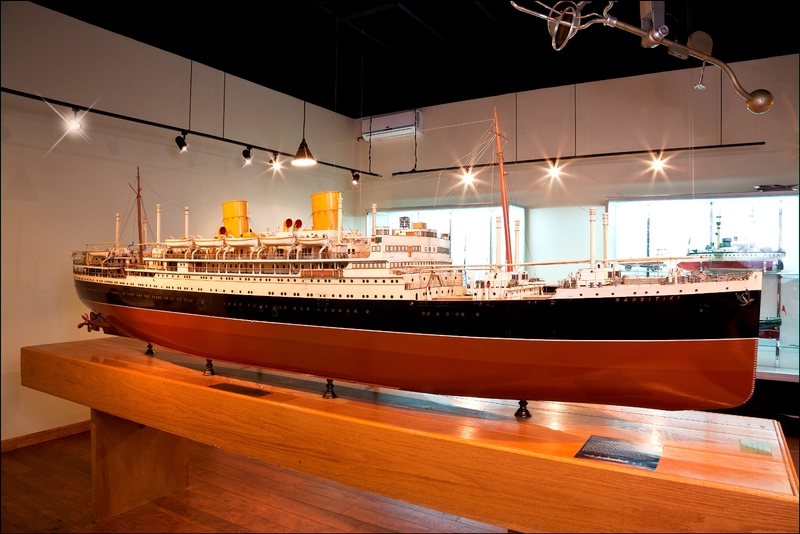 The DFW Elite Toy Museum’s newest addition is the Ship Gallery, which houses nine of the most elaborate model ships in the area. The first thing you see through 10-foot glass windows is the 137-inch long full-hull rigged builder’s model of “Kangitiki,” a British twin-screw passenger liner. Sporting a full stock of twelve individually named life boats, this model includes even the smallest details, down to the carefully chipped paint reflecting wear of the actual ship, working hinged wooden doors, and custom-cut glass panes in cabin windows and portholes. While this is the focal point and largest piece in the exhibit, perhaps the most elaborate hand-crafted models is the display model of the British composite clipper ship “Torrens,” which stands 44-inches tall and 72-inches wide. Part of what makes this toy so intricate is a set of three masts, each housing 5 to 6 sails, held in place with over 200 feet of threading which is tied, hooked, wrapped and wound exactly like the full-scale ship. Each wood panel making up the flooring was pre-measured and hand-cut, as were the paddles in the lifeboats and the helm. 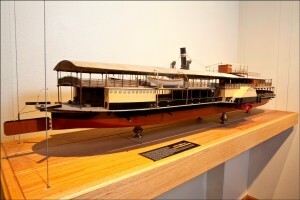 The oldest piece in the gallery is the miniature Marklin Columbia Gunboat. Enclosed in a protective case, the unique craftsmanship of the model can be enjoyed, along with the actual ship it’s based on. The nose of the original ship protruded unusually far, allowing it to cut through rough tides and sail more smoothly across open water. Made using extremely precise proportions, the gunboat model stretches to 34¼-inches long, and features 12 cannons, as well as a slot-based, clock face-style helm, housed directly above the rudder. The chipped, lead-based paint and yellowing varnish show the wear and tear of a model built in 1907, yet do not detract from the beauty of the elaborate hand-painted flourishes that line the port and starboard sides. Among these historic works of art is the steel side-paddle steamer – a full hull-rigged builder’s model of the ship “Swati,” which measures 19-inches high and 68-inches long. Somewhat resembling an early submarine, the turtle shell-like roof covers most of the ship. However, observant onlookers will notice the cabins housed under the formidable roof are recreated in complete miniature detail, including placement of the columns that hold it up. 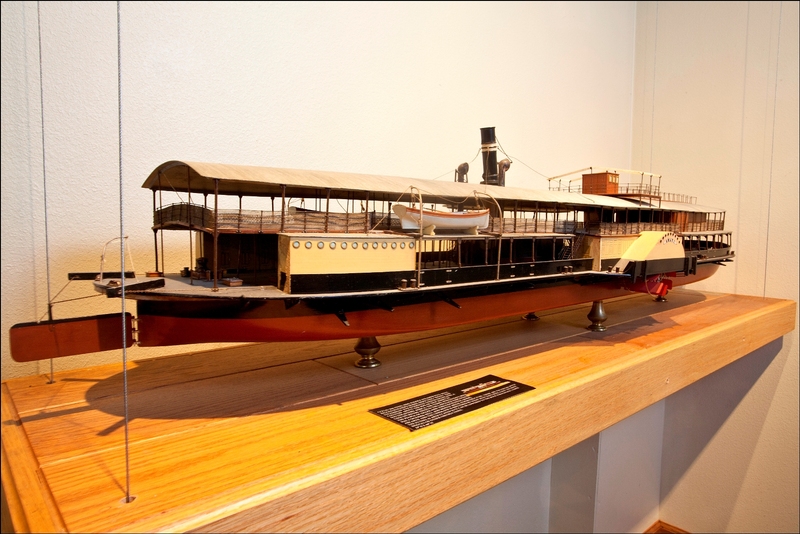 Also against the wall is a display model of the “Cape Girardeau,” a steam-wheeler steamboat that measures 44½ inches from the tip of its nose to the rear of its wheel. British battle cruiser “Hood” rests on a suspended floating display panel and stretches an impressive 86 inches in length. The only fully operational model in the room, it is the second-most valuable model. 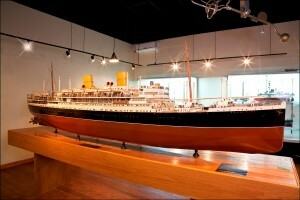 All-in-all, the Ship Gallery in the DFW Elite Toy Museum contains ships that cater to a wide range of historical interests. Several different eras are represented in full detail by the collection as a whole. Anyone who has an interest in nautical structures or historical navy seacraft will love spending hours examining and appreciating these exquisite and rare handcrafted models.